A great way to stay on track with any diet is coming up with healthier versions of your favorite dishes. It’s an added bonus if you are the only one in the family doing keto and you can make a meal the entire family can enjoy together. 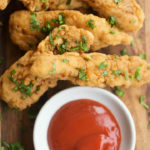 These chicken tenders are easy to make, only require a handful of ingredients, some spices, and are sure to please an entire crowd. One reason why so many people fail on a ketogenic diet is simply because they are usually the only one in the household implementing this new way of eating. Many end up feeling frustrated because they are usually eating an entirely separate meal from their loved ones. Not only does this require more time to make two different meals, but it can also be very isolating. A very simple way to stay on track is incorporating dishes everyone can enjoy like these keto chicken tenders. All it takes is changing the flour for the breading! Using almond flour in this recipe will even provide some extra health benefits for everyone as well. One of the greatest benefits of using almond flour as a replacement for white flour is it can help maintain healthy cholesterol levels. This monounsaturated fat keeps our blood vessels healthy and can reduce the risk of coronary heart disease. Almonds can help boost antioxidants in the blood and actually improve blood flow. Almonds contain a variety of macronutrients, micronutrients, and minerals that are perfect for increasing energy levels. Things like riboflavin, manganese, and copper are key in energy production. Almonds provide a steady flow of energy that won’t spike your insulin like white flour. Almonds are a wonderful low glycemic food. The balance of macronutrients found in almonds help regulate the rate of glucose and insulin released into the body. Minimizing these spikes in the blood is key to preventing and managing conditions like diabetes. No need to skip out on any breaded family favorites like chicken tenders anymore. Not only is using almond flour a great replacement for white flour, but the entire family can have the added benefits it has to offer as well. Get that same crisp, tender bite everyone will enjoy! Combine dry ingredients in a shallow dish (almond flour, coconut flour, salt, pepper, seasonings, and parmesan cheese). Whisk well. Add coconut milk to another shallow dish and season with 1/2 tsp of salt and a pinch of pepper. Set both dishes aside. Cut chicken into small pieces. Add chicken to coconut milk and coat well. Add oils to a large cast iron skillet and place over medium heat. Once oil is hot, drop chicken pieces into pan. Fry on all sides until golden brown. Remove chicken from oil and place on a paper towel. Serve with low carb ketchup, BBQ sauce, or dip of choice. Your instructions are not all there. You missed coating in the dry ingredients. It goes from coconut milk to frying pan. I made it anyways and very good but you might want to fix the directions.